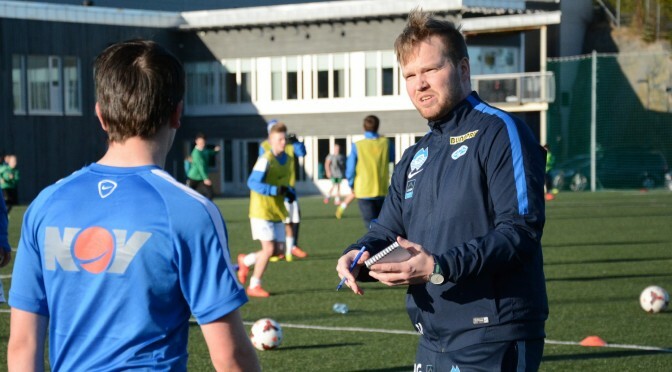 MFK coach, football nerd and MSc Sport Management student Fannar Berg Gunnólfsson (31) relishes in coaching young boys at the club with tactics learnt under the wings of Iceland’s respected national youth head coach Freyr Sverrisson. Fannar joined professional football at the age of 17 playing for the Icelandic football teams Njarðvík, Keflavík, Grindavík and Reynir Sandgerði as a midfielder and winger, before suffering multiple injuries to his ankle and thigh, a setback that led to his coaching profession. “I was a clever player and understood football,” he says. The head coach Freyr Sverrisson, who knew about his plight, invited him to help with coaching the team for the 19-years old and was impressed. His coaching profession begun with 13-years old boys, but he sometimes coached young boys and girls jointly. Fannar studied at Reykjavík University and is currently pursuing a master degree in Sports Management at Molde University College. His official coaching career with MFK begun in January 2015 after heeding advice from the dean of economics and social sciences at Molde University College, Oskar Solenes, who learnt about his coaching skills and encouraged him to apply for the coaching job for the MFK G15 team. He says his coaching style is calm, collected, organized and practical. Fannar still has a clear recollection of his first experience at MFK as a coach. The difference between coaching in Iceland and MFK is that it is more professional at MFK. A normal day of practice begins with a meeting and a chat with his fellow coach where they decide what to do for the day before beginning the training sessions. The G15 team’s formation is 4-4-2 and the defensive system strategy is based on ten bullet points for every position. When it comes to disciplining the players, Fannar believes that the biggest punishment is for a player not to attend practice. He has made several mistakes as a coach, but one that he can recall is when competing in the fourth division with the second team he coached in Iceland and he used a young player who was not ready to play. His way of handling stress and criticism is very positive. His plans are to complete the education to get a UEFA B-license in January, and then apply for the UEFA A-license and finally the UEFA Pro-license.